Looking for the best Birding trails around Atoka? Find the top rated birding trails in Atoka, whether you're looking for an easy short birding trail or a long birding trail, you'll find what you're looking for. Click on a birding trail below to find trail descriptions, trail maps, photos, and reviews. Started at Tillman around 8 and did the entire trail out and back. Amazing scenery and wonderful smells. Flowers in full bloom and the birds singing. Flat and easy, don’t miss the trail if your in the area. Very much worth the short stop! We parked & unloaded at the trailhead on Channel 3 Drive by WREG where there was plenty of secure/safe parking. We rode across the bridge while stopping at the lookouts for pics of the MS River, tow boats, Memphis and the 100-year-old bridge. You will end up at a nice landing area on the AR side. 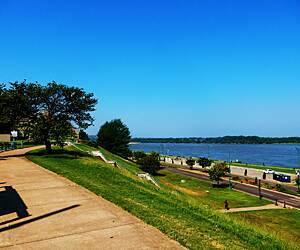 Upon returning and reloading the bikes, we headed to Harbor Town/Mud Island to go exploring. We parked at the Middle Lot (the North Lot was a bit sketchy) & picnicked on the lawn watching the river. We got back on our bikes and rode the Mississippi River Greenbelt (the path parallel to Island Dr.) south to the entrance of Mud Island and back north to the new Downtown Wolf River Greenway at the confluence of the Wolf & MS Rivers. 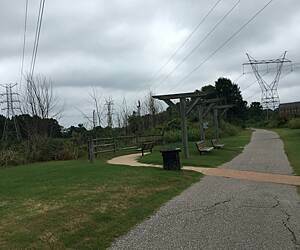 The new greenway takes you to the top the levee on one side and through “bottom land” on the opposite in an approx. 1-mile loop. Getting off the greenways, we spent the next couple of hours leisurely biking through the micro-neighborhoods of Harbor Town enjoying the residential architecture, friendly folks and views of the Wolf River Harbor and Pyramid. We truly enjoyed this relaxing spring ride over & on the banks of the MS River in Memphis. This is a very nice and well planned out bike or hike trail. Lots of scenic benches off the path to rest/relax and enjoy the view. A few short bridges, each unique, that cross back and forth over parts of the river. Has a very comforting and cozy feel. Nature and Modern Conservation at its best. Wonderful scenic bridge crossing the Mississippi River from Memphis to Arkansas. Bike or walk. Lights up with color at night. Porta Potties and picnic table area at the Arkansas side. Very close to Memphis Beale Street and Hernando de Soto Bridge. An easy trip add to anybody visiting Memphis. We walked four miles on this trail. It's nicely shaded in most areas. There is a camera and voice that welcomes you at the end where the rest room is. We look forward to returning and walking a different direction. The Big River Crossing is a unique trail. 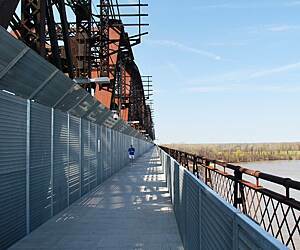 Relatively short (about a mile long), it is a walk/bike trail build on an old bridge over the Mississippi River. I started at the west end in Arkansas where there is a dirt parking lot at the end of the paved road (Dacus Lake Rd.). From the parking lot the trail loops around going up and under the railroad bridge before making a turn to go across the river. The western side is a moderate but steady climb to the top at the middle of the river where it levels out before becoming a very slight drop to the other side in Memphis. At the top, you are just beside the railroad bridge, although separated by a heavy steel grating. The trail surface is perforated steel plating which I would think might be slippery when wet. Also, being high up over the river, you are exposed to the wind. The day I went, there were barges lined up going up the river as far as the eye could see. The Big River Crossing is a unique trail with incredible views of Memphis, the river and the Arkansas countryside. 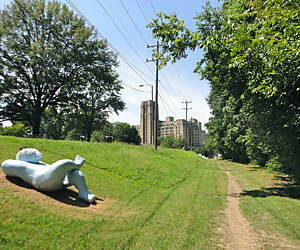 I will definitely visit this trail again on my next trip to Memphis. They are completely renovating the old Art Deco Sears into a vibrant business district. Seems a good destination for the Valentine/Greenlaw trail. We ride this trail every time we visit our daughter at college. One can make this trail as long or short as one likes since it borders Shelby Farm Park which has other trails. We've found nice places to eat toward mid-town (favorite Cheffie's Cafe) and there's some places along North Germantown Pkwy on the other end. The new section is nice. Looking forward to riding The Big River Crossing over the Mississippi. It was opening the weekend after our last trip. I drive from Kansas City, mo. to the Carolinas at least 3 times a year. I decided to take our bikes this year just to ride this trail. My husband thought I was crazy. it's 2 hours out if our way. it meant leaving kc early enough to ride from Tillman to Shelby farms and back before dark. I did my research, this trip is doable. The weather forecast leading up to our trip called for rain that entire week. I lived the next few days watching the weather channel. Monday morning at 4am we loaded up the bikes and headed for Memphis. We arrived to a beautiful, clear sky. The trail did not disappoint, it is gorgeous, well maintained. We saw many walkers, riders, all of them smiled at us. The trail has the right amount of shade trees for a hot day. Shelby Farms Greenline was also a great ride, we saw Bison, the lakes are nice. On the way back to our car it started to rain, we stopped under an overpass where we met a local rider who told us where to go for Memphis BBQ. Once back to our car we met a lady who rides the trail daily but walked today because of the rain. I can't rate this trail without rating the people we met. It was 5 star all around. We will definitely drive the 2 hours out of our way again. This is a great trail. It has been extended. There is an entrance at Cameron Brown Park that goes underneath Wolf River Parkway and follows along the Wolf River. The new section is a lush green paved trail with lots of shade, park benches and wooden bridges. The addition extends the trail approx. 1.5 miles. 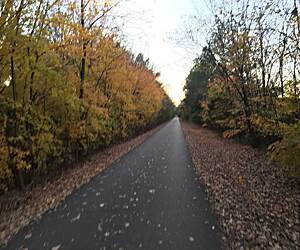 When you start at Cameron Brown Park and connect to the Shelby Farms Greenline it is 16 miles of paved trails (32 miles round trip).